Vivaldi is a Chromium-based web browser built for - and with - the web. It's rich in functionality, highly flexible and lighting fast - offering you a new way of browsing the Internet. Vivaldi is founded by the former Opera Software co-founder Jon von Tetzchner. 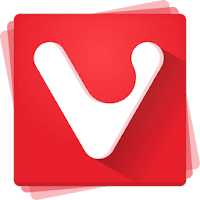 Vivaldi was officially launched on April 12, 2016, and is aimed at staunch technologists, heavy Internet users, and previous Opera web browser users disgruntled by Opera's transition from the Presto layout engine to the Blink layout engine, which removed many popular features. With Vivaldi, you can customize the browser the way you want. Do you prefer the browser tabs placed at the bottom or on the side of the window? Or, a different location for the address bar? Whether it's your keyboard shortcuts, mouse gestures, appearance or a modification to address color blindness, Vivaldi gives you the tools. With Vivaldi's bookmark manager you can organize and access your bookmark efficiently. You can set your own tags and nicks for lightning fast access. Vivaldi also features Tab Stacking that lets you group multiple tabs into one. Just drag a tab over to another for an uncomplicated grouping. With Tab Stack Tiling, you can display multiple tabs side by side or in a grid layout. Through multiple tab stacks that are tiled, you have multiple desktops, which you can switch between with a single click. Disclaimer: Direct downloads for the lastest version of Vivaldi 1.12.955.36 are provided by the official software's author, we can't guarantee safety, availability or download speed. Moreover, we don't and we won't provide any pirated/illegal versions or tools. We recommend you to avoid it as these methods can harm your device. If you like the software, buy it to support the developers. (We provide software discounts for many worldwide brands).